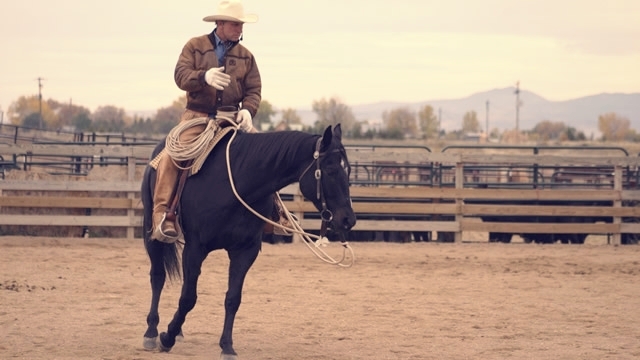 What I am looking for when I am riding a horse of any level, a green colt or an experienced bridle horse, is for him to stay centered underneath me. When I’m riding, I draw an imaginary rectangle around my horse; there is a line in front of his nose, one on each side of him, and one behind his tail. On a green horse the sides of this rectangle might be five feet out from his sides and on both ends. On a bridle horse the lines might be right at the tip of his nose, inches off my stirrups and right behind his hindquarters. One of the things I am trying to accomplish during my ride is to have my horse in the exact center of the rectangle. 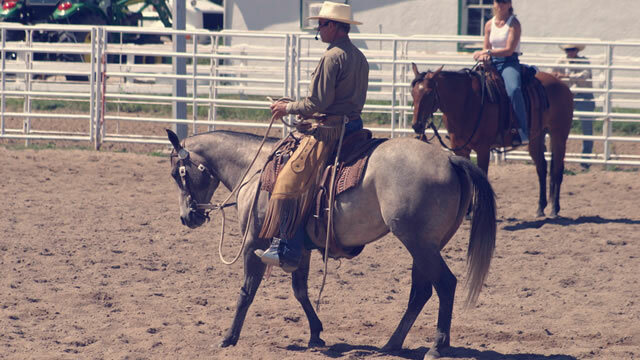 Being able to operate all four quarters of my horse, picking up a soft feel, leg yielding; all these things give me the ability to make adjustments when my horse leans on any side of the rectangle so that I can bring him back to center again. 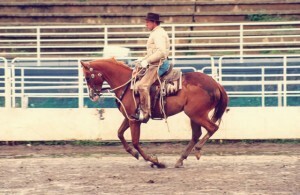 On a colt, especially, he will be centered for only moments at a time. I might be really busy fixing things up and getting things lined out on a colt, but I make sure that when he does find that spot, I become as peaceful as I possibly can. 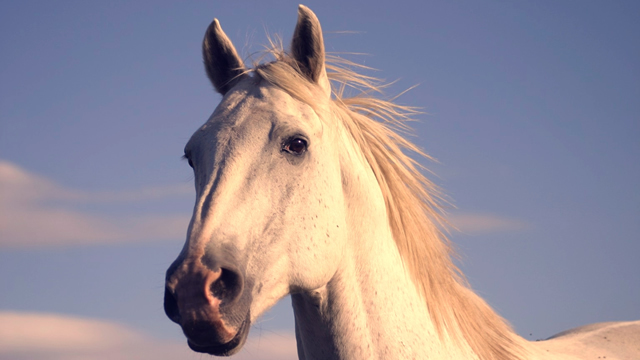 My horse can feel that, and at first it might not have much meaning, but since my being peaceful feels very good to him he will start to add up what he needs to do for me to be quiet and he will start hunting for the center of the rectangle. 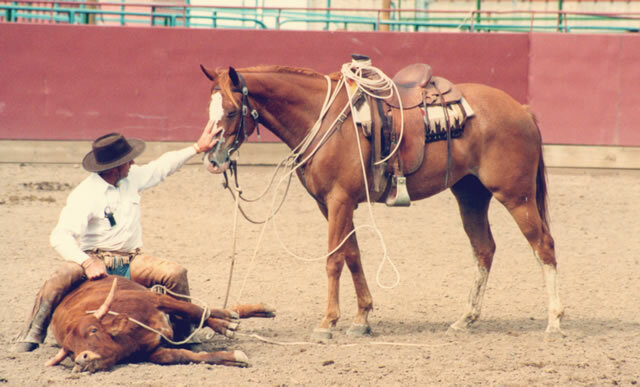 Your horse really wants to be at peace with you on his back, but if you don’t ever show him where he needs to be, you will just be bouncing all over the place. He won’t ever find how to be between your legs and reins. I got to track a few head of cattle on one of my colts last week, and even when I am galloping around tracking a cow, I am aware of where my horse is within my rectangle. If he’s pushing through my hand, he’s advancing toward that line in front of him, so I might slow him down and get him to rate. If I’m working my feet on a loose rein and he doesn’t respond to my leg, that means he’s getting close to that line behind him and I need to do more to get him to move up. If he falls left or right with both ends, I will use a leg yield to bring him back to being straight. 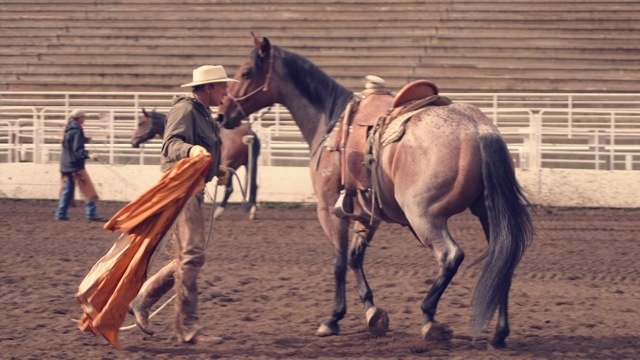 If he moves diagonally toward a corner of his body or if his front or hindquarters drift, I can use my reins and legs with my ability to move all four quarters to bring him back to the center. 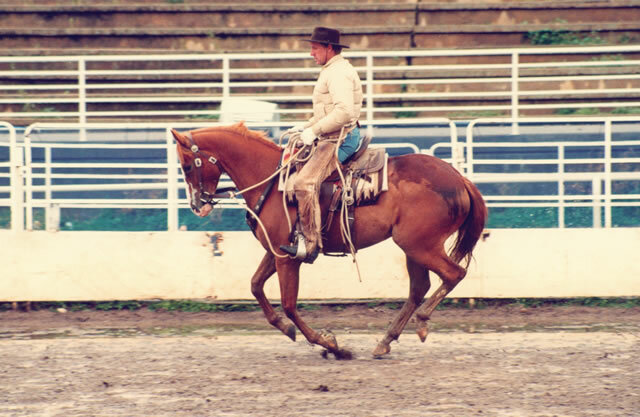 When my horse gets to the center, I will ease off for as long as he is there. It might not be long before I’m fixing again, but I try to do it in a way that I’m not picking at him. I’m just aware of where he is and I try to direct him to where he needs to be. Your rectangle always goes with you, so it doesn’t matter if you are going in a circle, there is still a center. As my horse starts to become more advanced, I start bringing my imaginary lines closer and closer to his body. I will expect him to drift away from the center less and less, but the key to getting him more dependable is good timing. If you have sorry timing, and your horse drifts over your imaginary lines and you don’t even notice until you are on the other side of the arena, then it’s too late. You’ve lost the opportunity. You need to keep this idea of where the center is on your horse the whole time you are riding. Be aware of his whole body. This is what I’m thinking about while I’m riding, and I am never not thinking about it. You also need to be careful in how you approach bringing him back to center. If you correct too much, or don’t release soon enough, you’ll blow right past the center and go right over the line on the other side. There is a certain amount of drift associated with that timing, so you will stop your correction before he gets to the center so that he’ll end up in the right spot. If you overdo all your corrections, you will just have him ricocheting off these lines and then you will have a really confused horse. Tuba is a Thoroughbred horse that I started for Lee and Melanie Taylor. 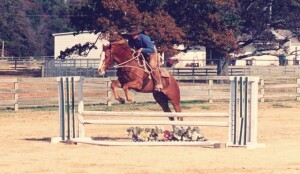 He was difficult in that he was super- athletic, but he kept me really busy all the time keeping him centered. I did not jump him at all until I went back to do a clinic in Memphis. By my sixth jumping lesson with Melanie, we were jumping 4′ oxers with a 6′ spread because he was centered before I asked him to jump. It was so fun because he was broke enough that I could point him at the jump and there was no question of him leaving; he was right there. I had taken the time to get him sensible. I had done clinics on him, roped and branded on him and spent the time to get him ready. 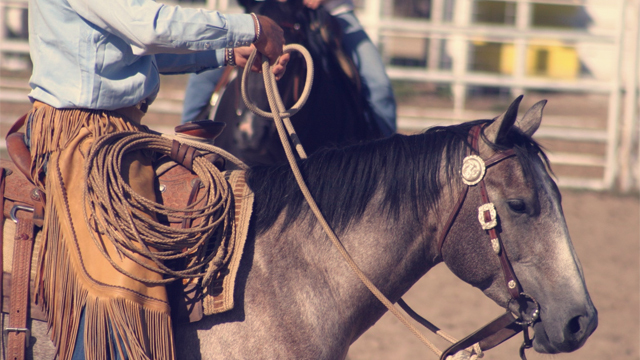 On my horses I am continually fixing and releasing. You can’t hold them in the center. I have been teaching clinics for 20 years, so my observations are based on fact; the least centered horses that I come into contact with are dressage horses. (Now don’t think for a minute that I am bad-mouthing dressage, because when it is done correctly by a good hand, it’s beautiful, it doesn’t get any better.) I am talking about the rider who does not let their horse find center and choose to be there; I am talking about the one who overconfines the horse and tries to hold him in the right spot. 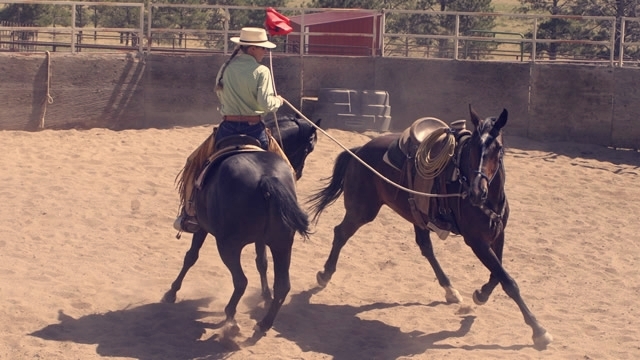 Their horses blow right through the front line, and if it’s an oppressive enough rider, they go right through the line in back and get their horse dull to the leg. It can happen with any horse in any type of gear with an oppressive rider. Where riders get into trouble is that they don’t give their horse enough room to find the center. They are going to make him do it, by being oppressive in the way that they ride. They think they can force the horse to the center and then hold him there. But the horse has to hunt it, you can’t make him be there. It doesn’t matter how you dress a horse up, it’s all the same. 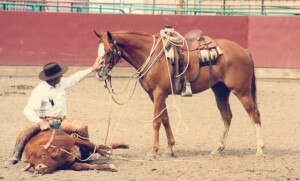 Getting a horse organized and on the spot is the same no matter what you are doing. Sometimes people will ask me about their horse and ask me what I would do if he were mine. I tell them that I would ride their horse like he was my horse until he looked like my horse. I don’t do anything different. If you have an older horse that has some kindergarten stuff missing, go back and get it right. Age is irrelevant. It might take him longer to learn because he has some other things in his past to overcome, but he will change a lot quicker than most people can. 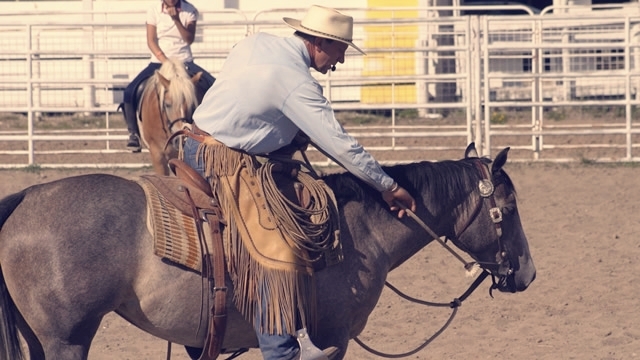 Once you have seen quality horsemanship and are exposed to the things you can do to help a horse be gentle and dependable, then why wouldn’t you do those things? 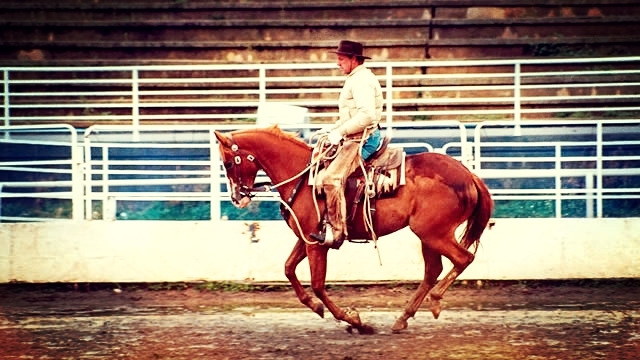 No matter what your horse’s age, you are going to try to offer him the best that you can. If you adjust what you are doing, he will adjust too; horses have an amazing capacity to make changes. There is always hope.